This is a follow-up to Why does Canon and Nikon limit or disable autofocus beyond certain f-numbers? I'm doing this to separate the AF aperture requirements from the linked question above. My goal here is to create a canonical answer for Canon AF aperture limits, with complete information for every Canon EOS model since the EOS D30. What apertures are required for Canon EOS DSLR cameras to autofocus? What apertures are needed to enable cross-type and/or high-precision autofocus? To increase readability and avoid exceeding the answer length limit, this answer has been split across two posts. General information and APS-C cameras are covered in this post; full-frame and APS-H cameras are covered in a separate post below. In general, Canon DSLRs require a maximum aperture of at least f/5.6 or wider to autofocus, although EOS-1 series cameras and certain newer models (including the EOS 5D Mark III, EOS 7D Mark II, and EOS 80D; essentially, any model with an AF sensor that has 45 or more points) are capable of focusing at f/8 with the center focus point. Depending on the camera model, and with some exceptions, a maximum aperture at least f/2.8 or f/4 or wider enables cross-type and/or high-precision focusing. 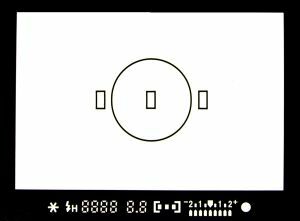 A horizontal-sensitive point or vertical-sensitive point is an autofocus point that can detect horizontal or vertical lines, respectively. 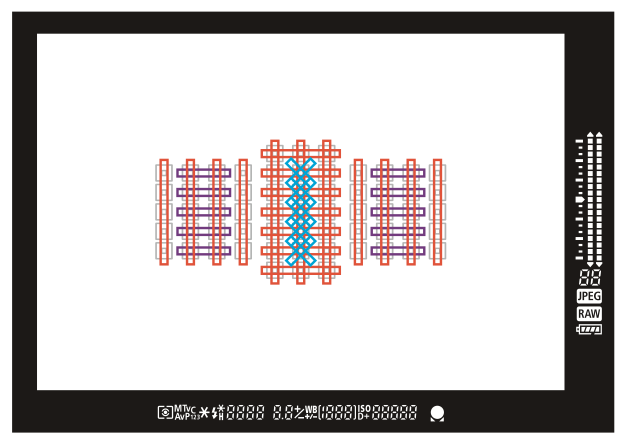 A horizontal-sensitive point cannot detect vertical lines, and a vertical-sensitive point cannot detect horizontal lines. A single-line point is a horizontal-sensitive point or a vertical-sensitive point. A high-precision sensor is an autofocus sensor that is capable of focusing within 1/3 of the depth of field of the lens, instead of simply within the depth of field. These sensors require faster maximum apertures, typically f/2.8 or wider, in order for them to work. A cross-type point is an autofocus point that can detect both horizontal and vertical lines simultaneously. Cross-type points are actually two single-line points superimposed over one another at a 90 degree angle. Depending on the camera model, the maximum aperture may need to be at least as wide as f/2.8 or f/4 for a point to be cross-type, because the vertical-sensitive part of the AF point may be a high-precision sensor. 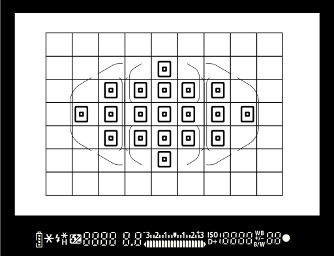 A dual cross-type point is an autofocus point that can detect diagonal lines as well as horizontal and vertical lines. Dual cross-type points are a cross-type point superimposed over another cross type point at a 45 degree angle. The diagonal sensors require an f/2.8 or wider lens in order to function because they are high-precision sensors. 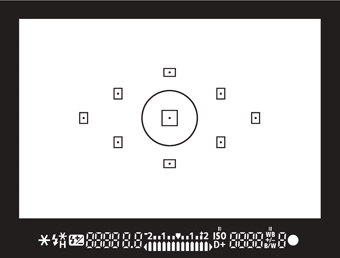 Where "autofocus does not function" is noted, phase-detection autofocus is normally impossible, either when shooting through the viewfinder or with the Quick AF mode in Live View, but it is generally possible to autofocus using the contrast detection-based Live AF and Face Detection Live AF modes in Live View. In addition, when an extender (teleconverter) is being used and the resulting aperture is less than what is normally required for AF, it may be possible to enable AF by taping the three extender-specific pins (which are opposite of the raised pins) on the lens side of the extender to prevent it from communicating extender information with the lens and camera, so that the camera sees the lens's aperture as though no extender is attached. This is not guaranteed to succeed as the AF system is not designed to operate under these conditions, and the Exif data will not reflect the use of the extender. Some third-party extenders may not communicate extender information with the lens and camera at all, with the same effect as the aforementioned "tape trick". The limitations discussed hereafter generally do not apply to third-party zoom lenses that have maximum apertures of f/6.3 at the long end of the zoom range, as they actually report a maximum aperture of f/5.6 to the camera. Note, though, that faster third-party lenses should be able to autofocus as expected for their aperture, including any high-precision focusing capability normally supported by the lens and body. All images in this answer should be attributed to Canon Inc.
All points function to f/5.6; the center point is normal-precision cross-type (it is both vertical- and horizontal-sensitive to f/5.6 and is not high precision at f/2.8). All other points are single-line (EOS D30 and D60: vertical sensitive only). Autofocus does not function below f/5.6. EOS D30 and D60: 3 AF points available. EOS 10D, Digital Rebel (300D), Digital Rebel XT (350D), Rebel XS (1000D): 7 AF points available. EOS Rebel T3 (1100D): 9 AF points available. Note that the EOS Rebel T3 (1100D) has essentially the same AF point layout as those in the next group of cameras, only that the center point is not high precision at f/2.8. All points function to f/5.6. The center point is cross-type, and all other points are single-line. The center point is high-precision dual cross-type with f/2.8 or faster lenses. Autofocus does not function with lenses narrower than f/5.6. The same aperture limits for the EOS Rebel T4i (650D), 40D, 50D, and 60D apply to the 7D, only that the 7D has 19 AF points instead of 9. EOS 70D: The above applies to focusing when using the viewfinder. In Live View, with Dual Pixel CMOS AF, phase-detection autofocus with apertures as small as f/11 is possible across about 65% of the total frame area (80% height by 80% width). Dual Pixel CMOS AF is fully supported with more than 100 EF lenses, including all EF lenses currently in production. Other lenses will autofocus in a hybrid phase-detection/contrast-detection mode when in Live View. Rebel T6i and T6s: Sensor-plane phase detection AF is available but only in a hybrid mode. If f/2.8 or wider, all 45 points are cross-type; additionally, the center point is high-precision dual cross-type. If f/5.6 or wider, all 45 points remain cross-type but the center point is standard-precision single cross-type. 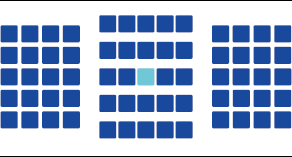 If f/8 or wider, 27 points remain available, 9 of which are cross-type. Autofocus does not function with lenses narrower than f/8. Group A: Most f/2.8 and faster lenses and lens/extender combinations, with the exception of those listed in other groups below, support 65 cross-type points, including one high-precision dual cross-type point in the center of the array. All 65 AF points and AF area selection modes are available. 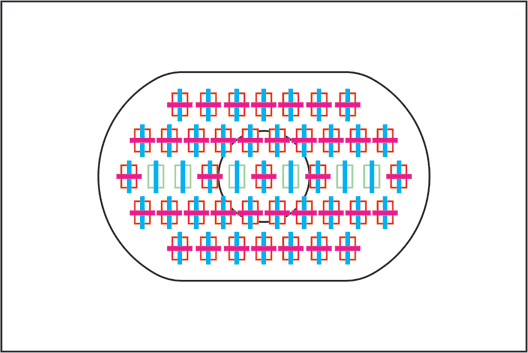 Group C: These lenses support 45 cross-type points; the outer ten points at each side of the AF array are horizontal-sensitive. All 65 AF points and AF area selection modes are available. 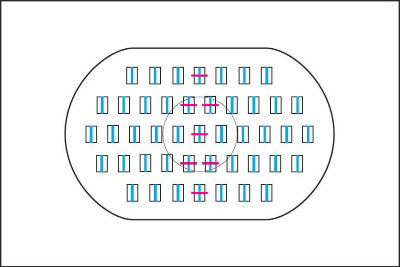 Group D: These lenses support 25 cross-type points in the center; the outer points on the left and right side of the array are all horizontal-sensitive. All 65 AF points and AF area selection modes are available. Group E: These lenses support 25 cross-type points in the center, but a total of 45 points are available. 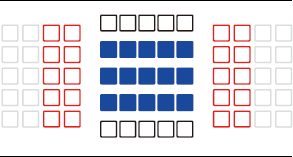 The outer ten points on each side of the AF array are disabled, and the remaining ten points on each side are horizontal-sensitive. 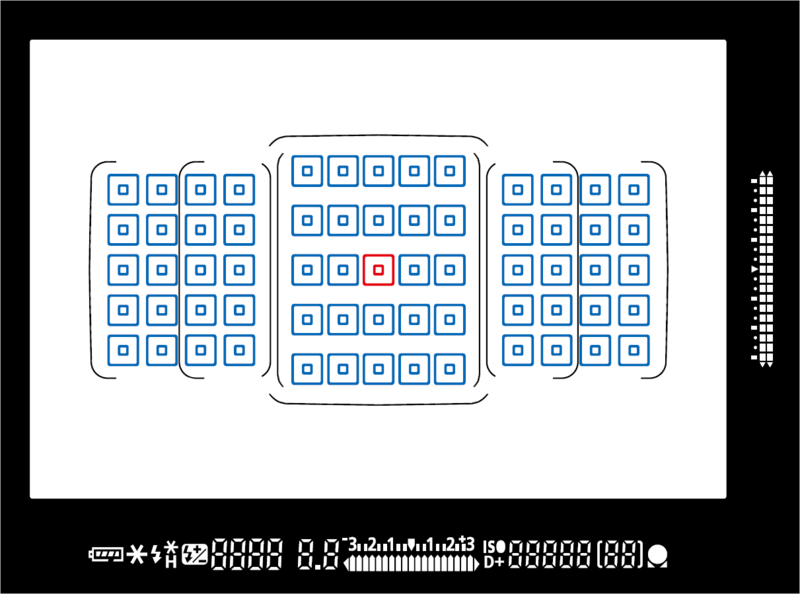 All AF area selection modes are available. Group F: These lenses and lens/extender combinations support 15 cross-type points in the center, with a total of 45 points available. 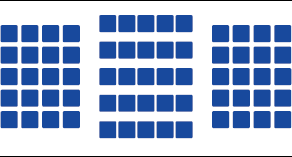 The outer ten points on each side of the AF array are disabled, the remaining ten points on each side are horizontal-sensitive, and the top and bottom five points in the center are vertical-sensitive. 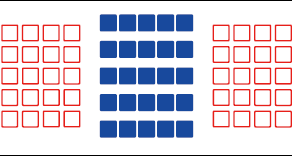 All AF area selection modes are available. Dual Pixel CMOS AF, as in the EOS 70D, is also available. For general information and APS-C cameras, see the answer above. All points function to f/5.6. The center point is cross-type, and all other points are single-line. The center point is high-precision cross-type with f/2.8 or faster lenses (but is not dual cross-type as it does not have diagonal-line sensors). Autofocus does not function with lenses with a maximum aperture narrower than f/5.6. All points function to f/5.6. The center point is cross-type, and all other points are single-line. The center point is high-precision cross-type with f/2.8 or faster lenses (but is not dual cross-type as it does not have diagonal-line sensors). 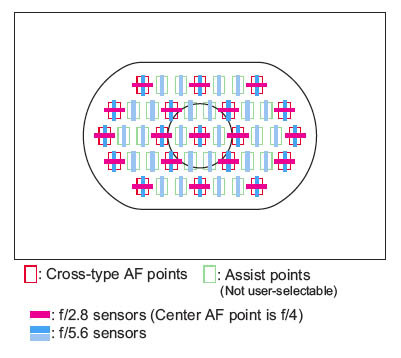 The invisible Assist AF points used in AI Servo AF function as horizontal-sensitive to f/5.6. With f/2.8 or faster lenses, two of these points function as cross-type. Autofocus does not function narrower than f/5.6. If f/2.8 or wider, all 45 autofocus points will function, with 7 points high-precision cross-type. If f/4 or wider but narrower than f/2.8, all 45 autofocus points will function, but only the center point is high-precision cross-type. If f/5.6 or wider but narrower than f/4, all 45 autofocus points will function as horizontal sensitive only. If f/8 or wider but narrower than f/5.6, only the center point functions as horizontal sensitive only. The other points will not work. Autofocus does not function narrower than f/8. Note that when using the EF 70-200mm f/2.8L USM lens (without IS) with an Extender, use the center point only as the other points may not focus correctly. All of the AF points will be horizontal sensitive only if a variable-aperture zoom lens is mounted, with the exception of the EF 28-80mm f/2.8-4L USM lens, which allows the center point to work as cross-type. EOS-1D Mark III and EOS-1Ds Mark III: When using the EF 70-200mm f/2.8L USM lens (without IS) with an Extender, use the center point only as the other points may not focus correctly. Group A: Most f/2.8 and faster lenses and lens/extender combinations, with the exception of those listed in Groups B, C, and D, support 41 cross-type points (21 in the center, f/5.6 sensitive, and 10 on each side, f/4 sensitive) and 5 dual cross-type points (in the center column, f/2.8 sensitive). 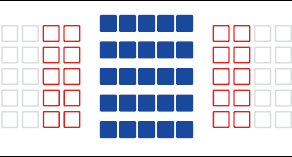 The remaining points are horizontal-sensitive. All 61 AF points and AF area selection modes are available. Group D: These f/2.8 lenses supports only 31 cross-type points (21 in the center, inner column of 5 on each side) and one f/2.8 dual cross-type point, although all 61 AF points and AF area selection modes are available. EOS-1D X with firmware older than version 1.1.1 and EOS 5D Mark III with firmware older than version 1.2.1: Only the center point can be used (all other points are disabled) for the above EF 35-105mm lenses, and AF point expansion is not available. Autofocus does not function narrower than f/5.6. 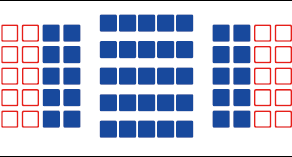 If f/2.8 or wider, 41 cross-type points are available, including 20 f/4 enhanced precision cross-type points (ten at each side) and 5 high-precision dual cross-type points in the center column. If f/4 or wider but narrower than f/2.8, 41 cross-type points are available, 20 of which (ten at each side) have enhanced precision, but the center five points are standard-precision dual cross-type. 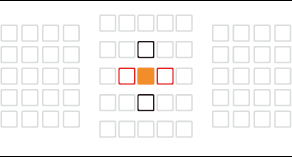 If f/5.6 or f/8 or wider but narrower than f/4, 21 cross-type points are available in the center area. The side points are horizontal-line sensitive. Just wanted to point that the information about focus points in EOS 600D/550D/500D/450D might not be accurate. The center point is high-precision cross-type only when the aperture is at least f/2.8. If below f/2.8 but at least f/5.6, all points function as either horizontal or vertical sensitive only (not both). Below f/5.6, autofocus does not function. " Canon website : "AF System/ Points 9 AF points (f/5.6 cross type at centre, extra sensitivity at f/2.8) "
Same is with 6D AF center point (f/5.6 cross type at centre, extra sensitivity at f/2.8), witch is same as in this article. I've started experimenting with the combination of a Kenko 2.0x teleconverter and a Canon 300 F/4 lens, which gives me a 600mm/F8. My initial experiments show that this combination on a 7D does, in fact, enable autofocus. It should be noted that the combination needs good light; it doesn't seem to work well in poor light. It's slow. It's not always consistent. but it works. It's too early for me to decide whether or not this is a combo I'd trust in field conditions on a regular basis (my initial take on the image quality is that they're sharp enough but I find the images a bit overexposed and the contrast is weak. Both are fixable either by adjustments on the camera or in post, but are definitely going to need to be evaluated further). It does, however, work, and give me a 600mm lens for < $1400 if bought new. And it works well enough to at least be worth experimenting with. The Kenko 1.4x might be an interesting experiment on some of the F5.6 lenses as Morris notes, too. Not the answer you're looking for? Browse other questions tagged canon autofocus aperture performance or ask your own question. How well will a Canon 2x extender work with a 60D and 100-400mm L? What's better image quality; full frame with Canon 400mm 5.6L plus 1.4 extender, OR, cropped frame with same lens? Are Toshiba SDHC cards good for Canon DSLR cameras? Which Canon DSLRs support High Speed Sync and what other requirements are there?